Choosing the perfect gift can be tough sometimes. 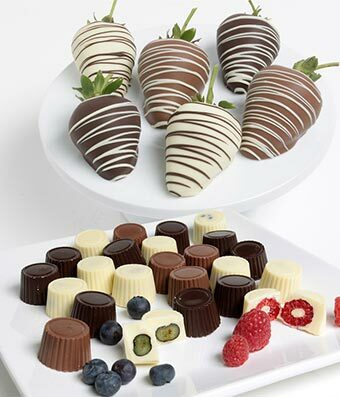 Let us help you with this delicious gift of chocolate covered fruits. These premium strawberries are hand-dipped in Belgian dark, white and milk chocolates by our Artisans and paired together with our fresh, chocolate covered raspberries and blueberries. Each piece of fruit is then decorated with contrasting chocolate drizzles. The perfect way to let your special recipient know you are thinking of them!